Hard disk is really a integral part of digital life. It is very important to constantly monitor health of your computer hard disk. The inbuilt Window utility like defragmentation and CHKDSK are not sufficient and have their own limitations. You must have a special tool to monitor, test and repair hard disk if it has any error / problem before its failure. There are many dedicated softwares for defragmentation of your hard disk. Defragmantation make your data on Hard Disk sequentially accessible and improve the read and write speed of hard disk. But its only one part. Error checking and monitoring hard disk for future failure is different task. If you want to save yourself from data loss, hard disk crash, and finding the stuff for data recovery you should use this utility. This is a graphical UI, Open source software for querying and controlling SMART attributes data on hard disk drives. 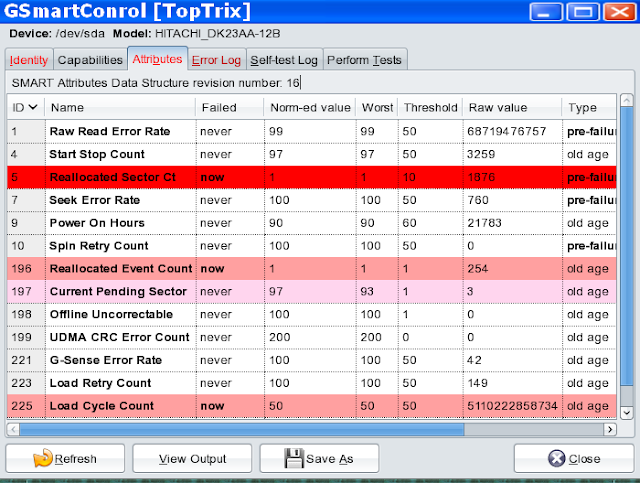 GSmartControl automatically checks hard drive's S.M.A.R.T attributes and alerts if there is any problems with drive. It also has options for running different self-tests, detailed hard drive information with technical specs for power on time, failure numbers, various read and write cycles count and their failure count, temperature of hard disk, S.M.A.R.T attribute values and error reporting. You can download GSmartControl from Homepage here. This is also a good Open Source software with graphical interface to smartctl. It also have options for querying and controlling SMART attributes data disk drives. The program checks your hard drive's S.M.A.R.T attributes every four hours and alerts if it detects failure in near future, high temperature or other vital parameter changes.